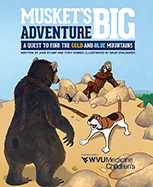 Follow your new furry friend, Musket, on a wild adventure as he seeks out the magical Gold-and-Blue Mountains. The curious pooch encounters all kinds of critters on his journey — although one, in particular, isn’t so friendly. Will Musket be able to dodge danger and find his new home?